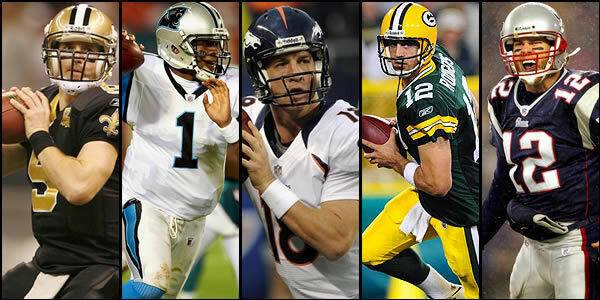 Choosing a quarterback seems easy. You already know the studs of the game – consistent performers like Andrew Luck, Aaron Rogers, Nick Foles and Peyton Manning. It’s just a matter of picking one for your roster, right? First, you’re working under a salary cap. You are going to have to carefully spend every dollar. Spending at one position means sacrificing at another. If you’re going to pay top dollar for Rodgers or Luck, you should be certain the sacrifice will be worth it in the long run. Second, not all QBs focus on throwing passes. Some guys love to run the ball. We’ll get to the reason that’s important in a second. For now, realize that it makes a difference and complicates the decision of who to roster. Third, even the top-ranked pass-throwers can get shut down by a strong defensive team. That means you have to do some research. So you can see that QB selection isn’t just a matter of picking the stud with the hottest track record. There are a ton of other factors to take into account. Here’s the good news: I’m going to give you a blueprint below for picking a quarterback in daily fantasy football. Obviously, there’s no way I can guarantee you’ll win by using my suggestions. But you WILL improve your odds. And that’s what daily fantasy is all about. And of course if you have read the site for long you know I advocate for checking Vegas betting odds and drafting QB’s from games with high projected over/unders and usually the QB from the team favored to win. If the team puts up that many points the QB is going to be a fair part of that. As I mentioned, some quarterbacks focus on advancing the ball by throwing passes. Others find themselves carrying the ball down the field – or at least attempting to do so – a lot of the time. Passes are more consistent than attempts to run the ball. As long as a QB’s receiver has good positioning and the QB’s aim is accurate, the receiver is likely to complete the pass. If he’s anywhere near the end zone, the completion might turn into a TD. Using the FantasyLabs trends tools, I can see the quarterbacks who are projected to have more than 40 pass attempts per game. I want to pick a QB from this list if possible. Running the ball carries more risk. Unless the opposing team’ defense parts like the Red Sea, the quarterback is going to face obstacles. And anything can happen at each one. Is it possible that he might score a rushing TD? Sure, but ask yourself… how often does that happen? Roster someone like Brees, who has time and again proven to be a pass-throwing machine. A guy like that will score more fantasy points on average than a quarterback who defaults to running the ball – for example, Cam Newton. I noted earlier that every dollar you spend at quarterback is a dollar you cannot spend at other positions. That doesn’t mean you should pinch pennies. Rather, it’s something you need to keep in mind to ensure the QB you roster delivers the most value per dollar spent. The biggest names are going to cost you. If you want Drew Brees, Peyton Manning or Andrew Luck in your lineup, you’re going to have to pay up. That means you’ll have to forgo performance at other positions, but given the fact your QB is going to be the point-scoring backbone of your squad, it’s a sound investment. Notice that Rodgers has a higher salary. Meanwhile, Romo threw more passes, hit a greater percentage of his targets (albeit, just slightly) and racked up more passing yards. Having Romo in your lineup would have helped you score more points in Week 1 than having Rodgers in your lineup. And you’d have earned those points at a lower salary. Bottom line: always be willing to pay up for your QB. But realize doing so isn’t always necessary. You want to know how a quarterback performs when he’s within 20 yards of his opponent’s goal line. It’s one thing to throw passes that move the ball down the field. It’s another thing entirely to turn red-zone opportunities into touchdowns. Stars like Brees, Manning, Rodgers and Luck perform well in the red zone. They throw with a high degree of accuracy under pressure and usually hit their targets. That means they’re likely to score TDs when they near the other team’s goal line. On the other hand, guys like Roethlisberger, Russell Wilson and Matt Ryan often have trouble converting those types of opportunities. Before you roster a QB, check out how he performs when he gets close to the other team’s end zone. Does he have a knack for hitting his targets and scoring TDs or does he squander his chances? You can make things needlessly complicated when looking up Vegas odds. Or you can do things the simple way. In my book, simple is always better. (See todays Vegas Odds here). There are two numbers that will give you the data you need to make a smart QB pick. Those numbers are the over/under and the money line. The over/under reflects how many points two opposing teams are expected to score in total. The line reflects how close the game is expected to be. You want to see a high over/under. The higher it is, the greater the odds your quarterback is going to throw a lot of passes and make TDs. A low over/under suggests minimal action. That doesn’t help your fantasy football score. The money line is important because it can signal the likelihood that one or both teams will start running the ball rather than passing it. Consider: a huge gap between the favorite and the underdog means a shutout. The former is expected to pummel the latter. When the score becomes lopsided, the QB on the winning team will throw fewer passes, preferring to advance the rock on the ground. It’s safer. But it’s also bad news for your fantasy score. Put simply, look for a high over/under for the game your QB is scheduled to play in. Then, check the money line, keeping your eyes open for big gaps. Remember earlier when I noted that even studs can get shut down by strong defensive lines? Let’s talk about that in more detail. Some defensive teams are so tight that even consistent performers like Brees and Manning have trouble cracking them. For instance, Kansas City, Denver and Seattle have performed remarkably well so far this season. They’re leading in tackles, sacks and interceptions. Of course, it’s still early in the season. Who knows what the landscape will look like in a few weeks’ time? The BIGGER point is that you want to roster quarterbacks who are scheduled to face weak defensive lines. Last year, that meant picking passers facing Arizona, Oakland and Tennessee. This year, keep your eye on QBs facing Jacksonville, Tampa Bay and Chicago. A pass-thrower who’s an ideal choice in a head-to-head or double-up may be a terrible choice for a guaranteed prize pool (GPP) tournament. Because winning those two types of fantasy football contests requires different strategies. For head-to-heads and double-ups (i.e. cash games), you want to roster studs. You need guys who turn in solid fantasy numbers game after game. You’re not looking for a value play who unexpectedly turns in a blowout performance. Instead, you want consistency. For GPPs, it’s the other way around. You have to beat a greater percentage of the field in order to cash, which means you need to take bigger risks. Variance is your friend. That being the case, roster a value QB who builds his game on passes rather than running the ball. Your hope is that his passes hit their targets, giving you more opportunities to score TDs. Brees is a solid pick for cash games, even if he has high ownership across the field. But he (probably) won’t help you win GPPs, where you’re relying on breakout performances. How Important Is Weather To QB Performance? It’s surprising how many team owners neglect to consider the weather when picking quarterbacks. The weather can play a major role in how a game progresses and on how points are scored. The cold tends to hamper a QB’s passing game. Passes are more difficult to throw. Accuracy declines and the risk of an interception rises. Quarterbacks tend to favor shorter passes or play a ground game, moving the ball forward by running it. The same can be said for windy days. Strong winds erode passing accuracy. The longer the pass, the greater the impact. Understandably, QBs playing in such conditions rein in their passes and often favor a ground game. As a general rule, rain increases variance. It makes performance at all positions, but particularly at quarterback, less predictable. That’s a big problem in cash games, where consistency is important. It’s less of a problem in GPPs, where it can actually be an advantage. You’re now armed with the tools you need to make smart draft decisions with regard to your quarterbacks. Visit DraftKings, FanDuel or new DFS site Draftday. Start small. Enter a few low-stakes cash games and put the above tips in action. Then, watch how your QBs perform. Don’t be surprised if you end up winning your first few contests! Draft Anyone Leagues – Now at DraftPot – My DraftPot Promo Code.